My medical statement is short and clear. Nuclear weapons are the most inhumane weapons we know. They are weapons of mass murder against innocent civilian populations, able to kill tens of thousands people through the explosion of just one warhead. In such a case there is no medical help. -- There are still almost 15.000 nuclear warheads in the arsenals of nine countries. A limited regional war with nuclear weapons can produce severe climate disruption, the consequence of which would be a global nuclear famine. Based on data collected and analyzed by climate scientists such as Alan Robock, IPPNW has estimated that the consequent losses in harvest could kill a billion or more people – mostly in the global south – from starvation. A nuclear war between the US and Russia, with the world’s largest arsenals, would bring about a nuclear winter threatening us with extinction. Terrorism is a serious problem. But nuclear weapons are not useful to fight terrorism. To the contrary, the longer they exist the more easily they might get into the hands of terrorists. And to quote Hans Blix, former head of IAEA: Nuclear weapons are weapons of terror no matter in which hands they are. In addition, there is always –pending like the sword of Damocles - the risk of unintentional nuclear war, of explosion by error or IT failures or misinterpretation of received data. We know of many examples from history when such communication failures almost led to nuclear war by accident. We need security, but we cannot take security for granted. We must build security and create trust. And security and trust can never be built by nuclear deterrence, by threatening entire populations with a nuclear attack. Often defenders of nuclear deterrence are unable to think out of the box of the vicious circle of mutual assured destruction. Nonetheless we know: the longer NWs exist, the more likely will be their use by possessing states or by terrorists, whether deliberately or by accident or other inadvertent circumstances. All people on the Earth have and shall have a right to defense. The best defense from a nuclear attack is complete abolition of all nuclear weapons. In medicine we say: preventing is better than healing. But in the case of nuclear war no healing is possible. We must prevent nuclear war, and the only way to do that is to abolish the weapons. „International Physicians for the Prevention of Nuclear War“ has been warning of these dangers and advocating for nuclear abolition four almost four decades. Some of us spoke out even earlier than that. 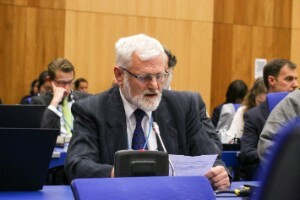 If chemical and biological weapons, antipersonnel landmines, cluster munitions and even the use of small dum-dum – bullets are prohibited by treaty under international humanitarian law, surely nuclear weapons must be prohibited above all. Our expert knowledge as physicians shows us, that only the abolition of NWs is the reasonable and effective way to prevent the incurable disease of nuclear war. We have been joined in this conclusion by the WHO and UNESCO, by the International Red Cross and Red Crescent, and most recently, by the World Medical Association, the International Council of Nurses, and the World Federation of Public Health Associations, who joined us in submitting a working paper to last year’s Open Ended Working Group on Nuclear Disarmament and to this year’s UN conference to negotiate a new treaty prohibiting nuclear weapons, which will resume its work in June. We know that large majorities of populations in most countries want nuclear weapons to be prohibited and eliminated. Article 6 of NPT which already calls for the elimination of nuclear weapons, will and must be strengthened by the ban treaty, which we look forward to seeing completed in a few months time. Let me close saying: Trust your doctor and prevent, support a ban, before it is too late!